The new Ortofon 2M 78 Series - the true MONO from Ortofon! The 2M Series of cartridges is designed for precise and accurate retrieval of the information in the record groove. Our philosophy is to play the record sound as accurate as possible, without coloring the sound. The name 2M was selected among several ideas. We wanted a modern name that would be easy to pronounce and to remember, and therefore an alpha numerical name was chosen. 2M means MM, which is the abbreviation for moving magnet. 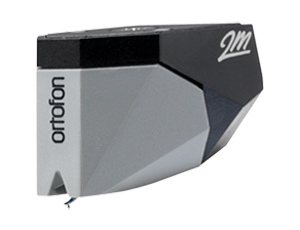 The 2M series of cartridges feature Ortofon’s trademark split pole pins, an invention that enables moving magnet cartridges to have a flat frequency response, as with a moving coil cartridge. Split pole pins were invented by Ortofon, and were originally presented in the 500 series and Super OM series. We have optimized the design for ease of mounting the cartridge, weight and size to fit the most common turntables at the market today. 2M Series provides excellent compatibility in an assortment of playback systems and with a wide variety of phono preamps. To find the recommended Ortofon replacement cartridge for your turmtable/tonearm please visit our Replacement Cartridges selector » . The new 2M 78 Verso model is an alternative product for bottom mount tonearms. The new 2M headshell is a practical and elegant solution for our customers who wish direct and easy mounting and replacement on their tonearm. The combination of 2M Headshell and 2M Series cartridge adds unique distinction to the turntable!